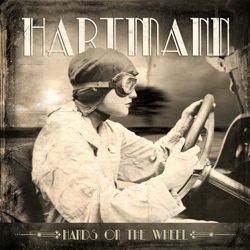 The history of HARTMANN began in 2005 with the successful release of their debut album 'Out in the cold', many times chosen as 'album of the month', and with their follow up 'Home' released in 2007. After their support tour for THE HOOTERS where HARTMANN performed acoustic versions of their material for the first time the band decided to play two exclusive shows at Pegasus theater in Bensheim/Germany in late 2007. Supported by three female background singers as special guests both evenings were recorded for the live CD/DVD 'Handmade' released in 2008. It is uniting outstanding material like real 'handmade' versions of the first two studio albums and previously unreleased tracks. 'Handmade' has always been considered as one of the most impressive outputs of HARTMANN and this re-release now contains both CD and DVD as special limited deluxe edition. In addition, the digital version of the CD will also be released as “deluxe edition” – now containing audio versions of all songs. Oliver Hartmann is also well known as being a member of the mega seller Avantasia and as frontman of the successful Pink Floyd Tribute Echoes with their latest release 'Barefoot To The Moon' (German charts No 20 in Oct 2015). After numerous tours as part of Avantasia, Rock Meets Classic and as mastermind of the successful Pink Floyd Tribute Echoes the exceptional singer and guitarist Oliver Hartmann now presents his new fifth studio album „Shadows & Silhouettes“ with Hartmann after nearly four years break since the latest release "Balance". The new album will be released on 30th of September on the artist owned label SONIC11 in cooperation with Pride & Joy Music. Supported by guest musicians as the well-known session keyboarder Jimmy Kresic (Rock Meets Classic, The Roots, Soundtopia), Miro Rodenberg (Avantasia) and also the Prague cellist Irena Morisáková and violinist Adéla Pecková the album contains 12 extra class songs combining modern melodic Rock („Irresisitible“, „Glow“ „High on you“, I would murder for you“) with many acoustic („The letting go“, „Shadow in my eyes“, „Still the same“) and partly very intimate moments („Jaded heart“, „Last goodbye“) pointing up the broadness and complexity of Hartmann. The catchy single „When your mama was a hippie“ will also be released as video clip. The album has been co-produced again by Sascha Paeth (Avantasia, Edguy, Kamelot, Beyond The Black, etc.) and mixed/mastered at Gate Studios Wolfsburg/Germany.